While switching over to a new computer is perhaps not a big deal for many people, in my case, or at least in this particular case, it is a very big deal. Somebody said something about there being only five things that happen in your life. For me, this may be one of them. For almost 30 years now, I have pretty much lived in front of a computer screen of one kind or another. My son knows me by the back of my head perhaps better than the front. For most of the past 20 years, I’ve been using a Sun environment as my primary workstation, since my first Sun 4/260 in about 1989. Before that, it had been various other UNIX systems as my primary machine. I moved through the Sun 4/260, Sparc IPC, and Sparcstation boxes, and most recently (until today, in fact) a Sunblade 100 purchased in 2002. I have been using the Gnome environment on Solaris on this box. For much of this time I have had secondary systems, for various purposes, specifically Macs (going back to the Mac Plus) and (cough) DOS and Windows boxes. However, the UNIX machine and various X11 environments have always been my PRIMARY system, i.e. the one I actually sit in front of to get real work done and the one that is always on. I’ve needed these other machines to run specific apps or share documents of specific types, testing apps on those platforms, or other such compatibility-driven needs. This has always been a bit of a hassle and a compromise. 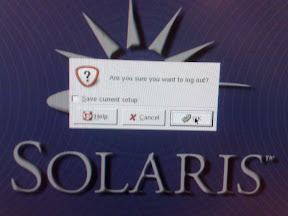 I can’t do everything I need to do on my Sun/Solaris/Gnome/X11 system (or not conveniently enough) so I have to suffer the inconvenience of multiple systems. I’ve tried using these other machines several times in the past as my primary environment, but I could never accept the inefficiencies for everything else I do, or in other words, the loss of productivity in these other environments for what I do. When Apple released Mac OS X in 2001, I jumped at that, to get a real UNIX OS underneath while still being able to buy software at Fry’s etc. 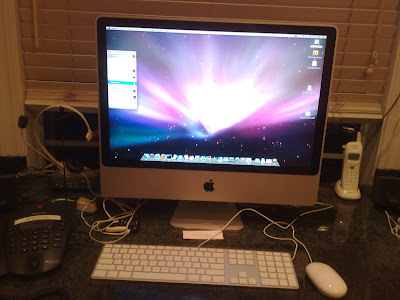 I tried in some earnest to use a Mac OS X machine exclusively. It was painful and ultimately, I had to fall back to the tried and true reliable and efficient X11 Gnome and KDE environments on pure UNIX machines. 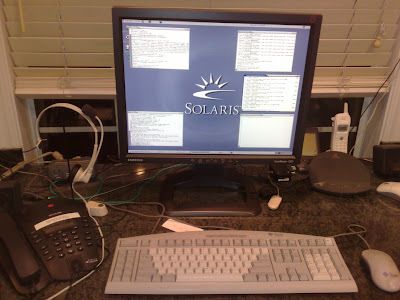 In particular, my “real” machine continued to be the Sunblade 100 with Solaris and Gnome. But I have been using Mac OS X boxes since that time more and more. Frankly, two of the most painful parts of using a Mac or PC compared to my Sun environment are (1) lack of (or weak) virtual desktops, and (2) cut and paste inefficiencies. This latter may sound trivial, but if you cut and paste as frequently between as many simultaneous windows as I do, it adds up to a big problem. Nobody has yet caught up to how it works under X11 (for 25 years). I had played around with add-on virtual desktops for Mac OS X, but none of them really worked anywhere as nicely as Gnome (or KDE for that matter). Now that Apple released Mac OS 10.5 Leopard with “Spaces” I finally decided to bite the bullet and make a Mac my PRIMARY workstation. Spaces is not as nice of a virtual desktop interface as those on Linux or Solaris, but I’m just going to live with it. It is much better than nothing and hopefully it will get better. Also, there has been no improvement to the cut and paste interface under Mac OS X. But, I’m just going to suffer with that too. I’m hoping to make up these losses in productivity through the other benefits of Mac OS X, and not having to switch systems to fiddle with a Word document or Excel spreadsheet, and a bunch of other advantages (hopefully). The computer is dead, long live the computer!